This has been a long and satisfying summer. Not because of Seattle's weather, or because our travel schedule was lighter, or because of the fabulous strawberries, raspberries, apples and grapes. Because of the decluttering that happened at our house. I'd say we're pretty typical of couples in or near retirement. We no longer need all the stuff we have, and the house is too big, and there are stairs and slippery winter driveways. I wrote about this last year in a post called Downsizing: a difference of opinion. It took a year to get started on this very large project. I convinced Art that we should give it a shot, and we made a plan, which I talked about in Rightsizing: a paradigm shift. The shed at the rear of the house: Art sold a 1982 Yamaha 750 (in pieces) and a sidecar for $60 and gave away a 1981 Yamaha 650 (not running). The new owners have a happy project to occupy their rainy winters. He gave the generator to his son Jason. All other inanimate objects in the shed were given away or carted away or taken to Goodwill. The shed is now occupied by Art's Ford Ranger for the winter. The truck has a shelter! Under the upper deck behind the house: All the unusable wood and other items have been donated or hauled to the dump. The orphan garage door that used to be a wall sheltering the view of all the stuff from the street has been disposed of. Under the deck is an open area! The basement great room. Used for storage for at least the last eight years, everything has been given away to kids or to neighbors via Buy Nothing Brier (like Freecycle). The inversion table was sold for $80 to a young couple for the woman's dad, who has a bad back. The pile of things belonging to Art's son Jason was picked up on Wednesday by Jason. The three metal shelving racks are partially empty, for use by our winter tenant. The garage: Used for storage for the last 23 years, usable things have been put in the gravel area near our driveway with a spray-painted "FREE" sign. What wasn't taken was hauled to the dump last Tuesday. The workbench was given to Clare, our across-the-street neighbor who just bought her house. Inside the house and out: Buy Nothing Brier is a Facebook group with 961 members. I took pictures of each item we wanted to rehome and posted them with a comment. From inside, picture frames, kids' toys and games and dressup boxes and books and bread-making machines and comforters and fanny packs and bamboo placemats and cosmetic bags and cold therapy systems and VCR recorders and snowshoes and fold-up dollies and candlestick holders and vases and Art's grandfather's lineman's climbing gear. And on and on. Someone or several people would express an interest. The taker got their name on the item which was set out on the front porch. Of all the people who stopped and picked up something from our porch, I only met one of them. It's an efficient system, and we have the satisfaction of knowing that someone will now enjoy and use what we no longer need. 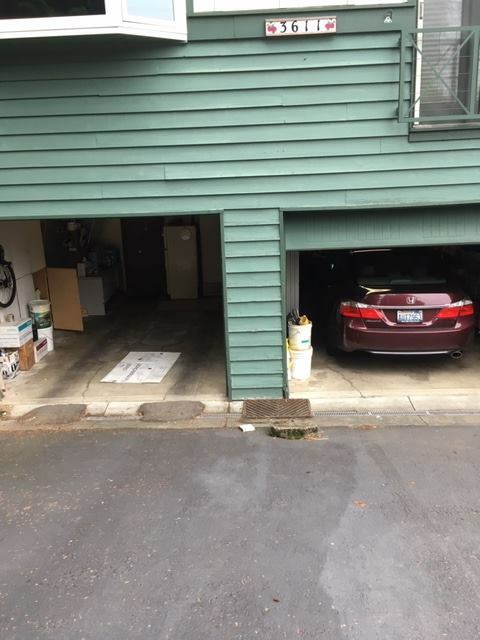 Several weeks ago I said to Art, "If I ruled the world (I say this when I know it's an attempt to control him), your side of the garage will have room for me to park my Accord this winter, so our tenant can park his car on my side." On Tuesday of this week, I came home from coffee with a friend to this sight: My car on Art's side of the garage. For the first time since we moved to this house 23 years ago. I told Art it was the greatest gift of love I'd ever received from him. And that is saying a lot. I asked Art just now what he thinks about this project. He said, "It's coming along. I didn't want to do it because most of the stuff was projects that I had planned to do at a later time. And the time just slipped away. So it felt like I was abandoning my projects. But looking at it over and over, I could see that I wasn't going to have time. "I don't think I could have done it without Penni, the decluttering coach. When I would get stymied she would say, "Do you have to do it?" And if I was still stymied, she'd say, "Well, put it aside. We'll get to that later." Not like the books and stuff that say you have to make a decision and then go do it. It was a working project. Where I could look at and think about things, and then if it was still too big a thing, take it up another day. No pressure. "It's not done. When we got the renter for the winter, I just started putting everything away to go through next year. Take a break from it. "I've gone through the missing part of it. I'm glad it's done." That is great progress. I agree that the cleared out garage was a major act of love. My husband was a collector but he was also very discriminating and very neat and organized. You would not have guessed the sheer volume of stuff stored on our house. He had started major divestment into retirement, but he did not live long enough to finish the job. It was a daunting task for me since I knew little about the value of things but he had left me with a list of those I could ask for help with that. I have so little attachment to stuff many of my family and friends think there is something wrong with me. I have trouble breathing in a cluttered environment. Good for you. Don't let any new stuff come in and take the place of the removed items. I cleared all of the drawers in the guest room a few years ago. Then I took on a volunteer position that involves reading to first graders and now those drawers are filled with puppets! I admire your success in decluttering; you created a lot of empty and useful spaces. That was a lot of work but very worthwhile. Well done. I am studying your process and progress for future reference. Wow! Just Wow! When we moved three years ago we gave/sold one full moving truck load of stuff. I've yet to figure out what we sold/gave away! We still have more to go. It is a slow process, but worth it in the end. The surprise for us at my mother's house was she had enough stuff to furnish the houses of three "kids" and five "grandkids". Now she lives in 700 sq feet but still has lots of stuff. Well done! I've been trying hard to declutter for the last couple of years, in preparation for retirement and downsizing. I'm certainly not at the point Art and you have gotten to but within the next six months I hope to be. Enjoy your time in Tuscon. Your commitment was amazing and the results satisfying. Careful though for when I moved last time I totally decluttered. Now I think I have accumulated more than I got rid of. Scary how it happened. Congratulations, Linda and Art. This is a huge accomplishment...and a very inspiring post! Congratulations on downsizing and getting your partner to agree. I have tried but have c ome to the conclusion that the only way to do it is to burn the house down after we leave. The was a great way to start.I am amazed at how our habits of shopping and gifting in our generation have led to so much clutter. Even after a declutter it somehow can creep back. Interesting that you have a winter border. Sounds like your system has worked well. Doesnt get easier as we get older, so good you did it now. Good job! We have begun, and Peter has done more than I have but he has more stuff to go through. Good job on the downsizing! When we moved from Seattle to North Carolina, we took most of it with us. Dumb, really dumb. When we moved into the RV and sold the house, we jettisoned almost all of it. We kept a 10x10 storage room with some furniture. The thing I miss the most is a silk Grandmother's fan wall hanging I made. I kept the two ugly ones, and pitched the good one. That is a decision I would like to have back. Anyway, we're in a new house now and I'm really hoping we don't relapse into entertainment shopping and keeping stuff "because you never know if you might need it." Great job! Downsizing is my goal as well. The kids live in Europe and their tastes don't run to ggg-grandmother's Victorian stuff. Unfortunately I'm disabled and don't have the energy to do the work myself. I need to find some help! You'll love Tucson! Whew ... I'm tired just reading this post! But having gone thru it myself, I know how emotionally difficult some of those decisions can be, and I also know the great feeling of accomplishment, and freedom, when it finally gets done. Downsizing is the very definition of "getting a load off."